There comes a time in every expats life abroad that they have to face the difficult decision of how to respond to someone that they’ve actually come to know and built a relationship with who asks for help in a time of need. This is much different than giving some spare change to the random beggars we come across, but this is when a friend, or neighbor, or student has a real life out of the ordinary problem and they come to you hoping to find some help. Every expat handles these situations differently, some with very strict rules of how to refuse such requests in order to maintain a reputation of fairness and not present opportunities for material aid to damage the relationship already built on other grounds. Others tend to keep an open mind and receive every request and at least listen to the person’s story to see if or how they can help and end up judging each situation on an individual basis. And then there are those who just can’t say no and become the charity sugar momma/daddy regardless of whether they get taken advantage of or not. I fall somewhere in the middle, with the open mind sensitive to needs, but also unafraid to tell someone, “Seriously, don’t waste my time. Go annoy some other chump.” I wanted to share a couple examples. Last week on the same morning that I wrote the “Beggars 101” post, I had a woman in my office brought to tears as she explained to me her problems. Typically, it’s not unusual for someone to put on a sad face or even squeeze out a tear when asking for a handout. But you’ve got to understand who this woman is. We’ll call her Madame O. She’s tough and even a little intimidating if you don’t know her. She’s short, but certainly not small and wherever she goes, her presence is known. She’s what Haitian’s might call an iron lady, and you don’t mess with iron ladies. She sells staples such as rice an flour in the market and has 14 kids, 11 of her own plus 3 nieces and nephews that she’s taken in. I met Madame O more than four years ago when I was doing damage assessment work on homes affected by the hurricanes that had hit the country that year. She was the next door neighbor to a house that the organization I was working for at the time was rebuilding, and we ended up buying her some extra sheets of tin to repair her roof as well which was in bad shape. Ever since then I’ve remained friends with her knowing that whenever I walk through the market I can count on her to give me a little bag of peanuts as a gift. She’s never asked for anything, not because she doesn’t need, but because she’s too proud to let anyone think she can’t take care of things on her own. I didn’t give Madame O anything that day and still haven’t. I just tried to give her some words of encouragement and tell her we’d talk again soon. But I probably will giver her something when I have some extra I to share. When a neighbor like that is struggling so sincerely, as a part of this community I (we all) have to do what I (we) can to help lighten the load. That’s what it means to be part of a community in Haiti. Being a part of a community in Haiti also means having to put up with some real whackos sometimes too. There is another neighbor of mine whom I have a history with, we’ll call him Pastor O (no relation to Madame O), who hasn’t been as lucky as Madame O on his trips to knock on my door and ask for help. For a while I was very patient with him because I realized that I invited him to beg once upon a time when I made some pity buys from him for some art products that were really crap. Ever since then he hasn’t stopped pestering me for help on one thing or another, but it’s never anything serious enough to waste my money on. Usually I just say, “Sorry Pastor O, but I can’t help you. Have a nice day.” And then go I into the other room or try to look busy until he goes away. But one day in particular I completely lost it on Pastor O mostly because of his tragically poor timing. I had just gotten done bathing. Technically, I was still bating when he showed up, but when I finished and walked through my house in my towel to go put some clothes on, he stopped me en route with some absurd request. Rule #1 from the Haitian School for Beggars: Don’t ask a naked guy for money. He doesn’t have anything in his pockets. Apparently Pastor O was absent they taught that one. But I gave him the benefit of the doubt although not too politely, “Get outta here, Pastor O, you ain’t getting anything from me.” And then I turned to go into my room, but he stopped me stuttering his request again. “But, but. but…” That’s when I lost it and the Creole swearing started. “What the #%$@ do you want from me? Get the #*&! outta here and leave me the %&#* alone, you hear?” He didn’t hear. So I picked up my broom and started towards him. He ran down the hill but stopped halfway and turned around to look at me again. I threw the broom on the ground and bent down to pick up some rocks to throw at him. That’s when my towel slipped and my neighbors across the field from me, all young women, who had been watching by now got to see a pasty white Iowan moon. I threw the rocks anyway before arranging my towel and yelled some more cuss words at Pastor O as he ran away. My three roommates who were watching the whole thing from the steps were laughing hysterically at the whole event, so at least I provided them with some entertainment for the afternoon. And my antics worked for several months at least as it took that long for me to see Pastor O again, but he’s certainly a lot more careful what he says to me these days and definitely doesn’t talk to me when I’m naked. But I apparently didn’t wound his ego too much because he recently offered to give me his church as a gift. Thanks, but no thanks, Pastor O. No, I don’t recommend throwing rocks, threatening with broomsticks, or swearing at beggars or even acquaintances asking for help, most of the time, but I simply offer both of these stories as ways to show that I don’t think there are any clear cut answers and anyone that tries to apply rules and formulas to these situations is making a mistake if they don’t even offer the person the chance to tell their story. As I’ve written in my previous posts on the subject I think we all have to realize our role as human beings, in whatever community we find ourselves in, to make sure that all other members of that community can fulfill their role while still realizing the beauty that life has to offer. Sometimes that could mean giving some change, sometimes that could mean trying to raise more significant funds to help someone, and sometimes, maybe, you just gotta get naked and throw rocks. 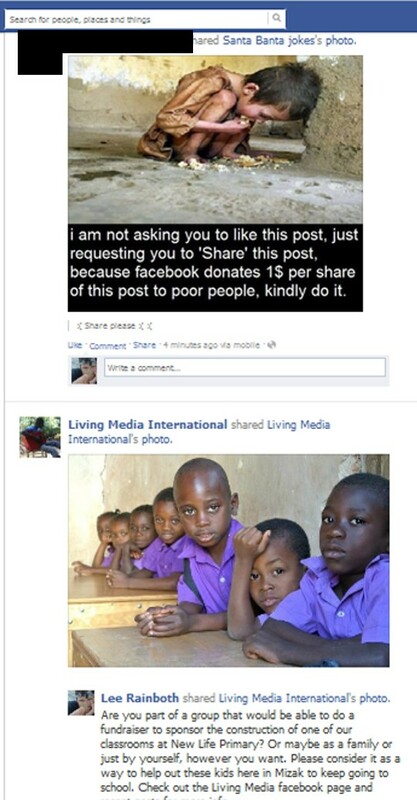 I have more that I want to post on the subject of beggars, but I am taking a slight detour for this post because of the perfect timing of two posts that appeared on my Facebook newsfeed today to provide a glaring example in the differences in how people perceive and portray individuals in need of what someone deems to be help. Sure, the second image is one that I shared from my own organization but that’s not the point because my organization is not the only one out there who chooses to portray those that we work with as human beings with dignity. It just so happened to show up right below the other image on my news feed which left me shaking my head once again at the fact that people still allow their hearts to break by the images and comments published such as the first. In this case, however, the image came from a jokes facebook page, not an actual organization, so I can only assume that it was intended to be some sort of funny prank. “Hey let’s post this to our facebook page and see how many gullible people we can get to believe this crap!” That can be the only explanation, right? I think that the frowny emojis afterwords really bring the point home. Of course, I can’t blame my facebook friend for wanting to help “poor people” whoever they are, wherever they are, and however Facebook is going to allegedly get that dollar to them. I’m sure Mark Zuckerberg will get right on that. It’s not my friend’s fault for feeling sympathy for hungry children and right at the moment that she came across this picture having to decide to use it as a tool of awareness. I hope someday that boy doesn’t have to eat scraps off of the floor too. But we as a society have to stop skimming the surface of this ocean of proposed solutions to helping the people of the world in exchange for real human connection while we feign sympathies at unspecific sufferings. So, Santa Banta, whoever you are, thanks for the funny joke, but next time just draw a cartoon or post a picture of a cat in a funny hat or something rather than tricking well meaning people into thinking that their making a difference. Kindly do it. Thanks to my pasty white Irish skin, I’m perceived in this culture to be one of the Haves which is why the beggars in the street, at the station, and in front of the store are drawn to me like a magnet. My Caucasianness is like a cheap neon sign on the Vegas strip screaming out the possibility of a beggar’s jackpot. Put on a sad face, send out your rehearsed plea, and roll the dice. Although more often than not, I have to refuse them, I can’t be offended by their perception of my skin color. I know that that’s one thing they must learn before they graduate from the Haitian School for Beggars. Whenever you see a white person, you gotta drop whatever you’re doing and go in for the kill. Although I have to tell them no, I try to put myself in their shoes and empathize with their situation. I try not to break their calbas. And although I can never pretend to understand the hardships they’ve faced in their lives and the struggles that they go through everyday, I feel like I do understand their motives sometimes. Why? Because I’m a nonprofit manager. And nonprofit managers are basically beggars in nice suits. We’re tax-exempt beggars with powerpoint presentations and pamphlets. We’re professionals at institutionalized begging. We understand the same tactics like putting more pressure on certain people, the power of a sad story (See Donate or Siyovle Dies), and the importance of a good prop (crutches or a baby for example). In fact, although I haven’t passed through either, I assume that the curriculum at the (completely fictional) Haitian School for Beggars is very similar to that of most university degree programs in nonprofit management. 1. Mwen grangou. I’m hungry. What do Food for the Poor, Feed My Starving Children, Kids Against Hunger, and The World Food Programme do but beg for money so that they can feed people? 2. Mwen malad. I’m sick. Doctor Without Borders, Partners in Health, The Red Cross, World Health Organization, all beggars so they can find money to treat sick people. 3. Timoun mwen pa ka al lekol. My kids can’t go to school. Compassion International, World Vision, Plan Interntional, Save the Children, Central Asia Institute, CARE International, begging for money to send kids to school. 4. Mwen pa gen travay. I don’t have any work. Kiva, SERRV International, the Grameen Bank, give em money so they can help people find jobs and make an income. 5. Kay mwen kraze. My house is broken. Habitat for Humanity, Builders Without Borders, The Red Cross (again), just needing money so they can build houses for the homeless. This is not to criticize these organization’s methods but simply to say that I think we need to realize what we call fundraising isn’t that different than the average beggar in the street. We need to be real about it so that we can see the humanity in those beggars when we encounter them. We need to be real about so that we can be more effective fundraisers without fooling ourselves about what it is we are really doing. How have we gotten to a point where asking for money for these same exact reasons on behalf of others as long as we have nice websites and persuasive talking points is considered some sort of great and honorable humanitarian sacrifice, but when some individual decides to do essentially the same thing on their own it’s considered a social nuisance? I find it especially strange because I think that we in the nonprofit sector tend to have a particularly bad attitude about beggars perhaps because we can see them as the personifications of all the wrong answers to sustainable development. Perhaps because we see our programs as being such infinitely better solutions to the world’s problems than the path that these beggars have chosen. Perhaps because we think that they make us look bad, those of us who are working hard to change things while they surrender to following the same old habits. Or, perhaps, just maybe, it’s possible that we have a bad attitude about them because we see too much of ourselves in them and we don’t want to admit it. That’s why it’s easier to walk past and pretend we don’t see them. It keeps us from having to face the truth that they are the source that we have evolved from. And we like to think that we are a higher form of evolution, but from what I’ve seen in some cases, I’m not so sure that we are. And maybe if we realized this, and we took the chance, we would discover that we actually have a lot to learn from the beggars that we pass by everyday and give excuses to. Maybe we’d discover that they’re not reaching out for spare change as much as they are reaching out for the acknowledgement of the kinship we share as two beggars in this world, with different sized calbas, both empty, all the time. There’s a young woman that lives in the neighborhood nearby my organization’s art gallery where I frequently work. She is seriously mentally and somewhat physically handicapped but seems to be generally well liked and accepted by the community. I know nothing about her family or background but I can usually count on seeing her every time that I’m working at the gallery. She seems to spend most of her time wandering through the streets during the day usually in her thin nightgown that hangs off her skinny frame. I can count on seeing her and her seeing me. I can count on her walking up onto the porch of the gallery where I’ll be sitting, giving me a shy nudge of her shoulder and holding her hand out and looking up at me with a hopeful smile on her face. And I, without fail, will reach into my pocket and dig out 5 gourdes to place into the palm of her hand. And if I don’t happen to have 5 gourdes I will look around at my friends with me and they’ll all reach into their pockets until someone finds some change to give her. I, an unashamed critic of charity and hater of handouts, am physically and morally unable to refuse this girl’s requests. I know that I am just creating expectations with this girl that I’ll never be able to undo. However, the equivalent of 12 cents is certainly not going to cause me much distress but it certainly brings a smile to this girl’s face and hopefully brightens her day a bit. And for that alone, I feel it’s worth the cost. This girl, though, is certainly the exception because I am notorious for not giving to beggars that I encounter in the city. 9 times out of 10, however, it’s because I honestly don’t have anything to give, which releases me from having to make the decision. The Haitian proverb says, “You can walk by the beggar but don’t break his calbas,” meaning you don’t have to give him anything but don’t humiliate him either. This is a very fine line that foreigners who are expected to have change in their pockets have to walk in this and other cultures. I walk by the amputees outside of the grocery store. I tell the mother at the bus station, “I’m sorry but I can’t.” I ignore the old lady in the market calling out “blan!” But I don’t feel guilty. For one reason because I know that their begging is based upon an inverted racism that I refuse to acknowledge as legitimate. For a second reason, because we all know there are better solutions to helping people out of poverty than handing out money to whoever asks for it. Does it mean that these people don’t need it? No. But in those momentary encounters its not appropriate to try to educate them on economics or development to justify my rejection of their request. I know that they need it but giving them a handout isn’t providing them with the help that they need. If I had the time and felt so persuaded to do so, perhaps I could help develop a sustainable program to help those amputees find a trade or skill where they can be productive and make a little money for themselves so they don’t have to sit on the ground outside the store. I could probably help that mother at the bus station find a program to provide her support for her children so that they weren’t hungry and could go to school. I could probably seek out an institution that focuses its work on improving the lives of the elderly for that woman in the market. I could guide them towards some help, but that’s not my mission here in Haiti and none of us can expect to help everyone. Unfortunately, that means that some slip through the cracks and end up seeing begging as their only option. And we can tap into our cultural upbringing and adopt the attitude that they just need to pull themselves up by their bootstraps, but when we are also aware of the greater systems that have failed these people, that’s when we find ourselves walking that line where the right answer is very hard to decipher. Or maybe its impossible to see because there is no right answer. You can’t follow your intellect and you can’t follow your heartstrings, so you just make a split second decision of how to move forward with the next step of life and hope that no one gets hurt because of what you decide. Every time I walk by those amputees outside the grocery store, I think of another man that I know in the city who is missing a leg. I met him while working at a previous gallery in a slightly different part of town. They called it the door to the ghetto. It was a playground for all of the potheads and prostitutes in the city and I got to know some pretty colorful characters while working there. But this man with one leg was in control of it all. He was bald with a pirate-like beard and an imposing presence with a heavy set but muscular build. He was the most respected man in the neighborhood and with one word he could get whatever he wanted. He didn’t have to beg, he was able to reap what everyone knew he deserved. I was lucky to get on his good side and maintain a friendly relationship with him, but I would hate to see what it was like on his bad side. While working at the new gallery I will still see him drive by occasionally in his little red Subaru and he still stops and chats with me before heading on to his next important rendezvous. He’s not a man that requests pity; he’s a man that demands respect. And he’s living within the same culture, with the same obstacles, as well as the same opportunities as those guys at the grocery store. So how has one become the king of the ghetto while others have to beg everyday to survive? I don’t have the answers and I don’t think anyone does. Like I said, I don’t know if there are any answers. We can chalk it all up to fate. We can blame the government, or the NGO’s, or even the earthquake. We can argue about whether to give money or food or advice, but in the end, there is no reason to it all and it doesn’t serve us to try to find one. There is no rule book on when to give or not to give to beggars. There’s no checklist of criteria that a beggar must fulfill in order to find some change falling into their calbas. There’s just doing the best we can to pay everyone the respect they deserve as fellow human beings while we all muddle through this life together. And every once in a while that might include giving 5 gourdes to a girl who gives us an innocent shoulder nudge and a smile.